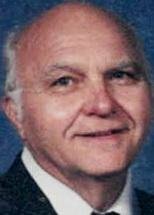 Dale O. Blough, 82, of Cedar Rapids, passed away Friday, Dec. 20, 2013, at St. Luke's Hospital. Memorial services will be held on Saturday, Jan. 18, 2014, at 1 p.m. at Just Jules, 835 Center Point Road NE, Cedar Rapids. Dale Oliver Blough was born on July 24, 1931, to Harold and Edna Foulk Blough in Waterloo. He proudly served in the U.S. Navy during the Korean Conflict. Dale was united in marriage to Charlotte Elmore on Oct. 31, 1953, in San Diego. She passed away in 2009. Dale worked 31 years as a machinist for John Deere. Survivors include his daughters, Jody Schulte, Kerry (Wade) Hinegardner, Debby (Tom) Laucamp and Becky (Steve) Frink, all of Cedar Rapids; two brothers, Bud (Mary) Blough and Jimmy (Dorothy) Blough; 11 grandchildren and 16 great grandchildren; and many loving nieces and nephews. He was preceded in death by his wife; a granddaughter, Amy Blough; a great-granddaughter, Mercedes Blough; and a sister, Norma Leitz.